What was it like to work at KNBC in the 1950s? All the people who could tell us are gone now. The story must be second hand. As an eager young broadcaster I would visit the NBC Belmont transmitter occasionally to listen to the old timers talk about the good old days. I think we all realized even then that the golden days of radio were behind us. I worked at a broadcast transmitter about fifteen minutes drive from the KNBC transmitter. Sometimes when I didn’t feel like going home after signing off the station at midnight, I would go hang out at the KNBC transmitter for a while. I knew almost all of the San Francisco NBC engineers. We were members of the same union, NABET. We knew each other from union meetings and from walking the picket line together. 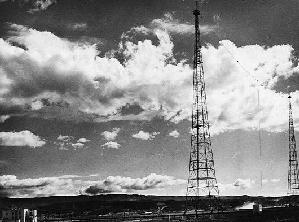 Television and FM broadcasting were expected to replace AM in a few years so it didn’t make sense to replace a transmitter for a short time. By the 1950s the GE transmitter final amplifier tubes were used only by NBC owned stations. Replacements were hand-made by the RCA transmitting tube factory at great expense. These tubes were reported to last for a long time. I was told that typical tube life was over five years, which was not unusual for bright tungsten filament tubes. From the front door you walked up a grand staircase to the second floor where the transmitter was located. 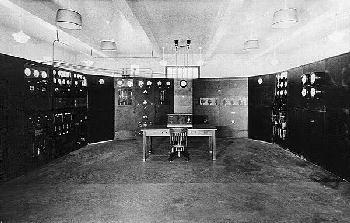 The transmitter was arranged in a ” U” shape with a control console in the center of the floor. I never saw anyone sitting there. 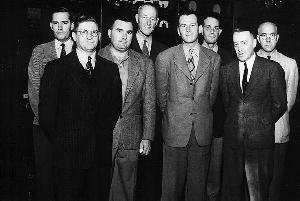 Operators usually were in an adjoining room with racks of audio equipment, monitoring equipment, a desk, and log-keeping typewriters. I believe the transmitter also could be controlled from this desk. Transmitting tubes used at KNBC required DC voltage on the filaments to reduce hum. Motor generators were the best way to get low-voltage high-current DC for the filaments. I never understood why bias voltage also came from motor generators because the voltage was not very high and the current was almost zero. 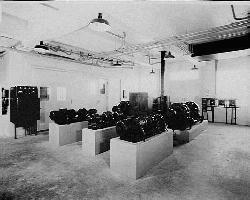 I believe the bias motor generators were replaced with conventional tube rectifiers in the 1950s to reduce maintenance expense of mechanical devices. 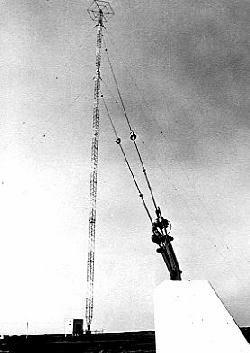 The original antenna was replaced in the late 1940’s with a Franklin antenna. 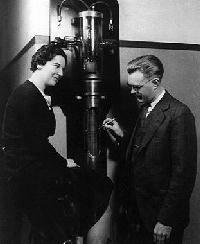 It lowered the vertical angle of radiation. This antenna increased ground wave radiation at the expense of skywave radiation. I was told that with the old antenna KPO could be heard in Hawaii and on the West Coast like a local station at night. 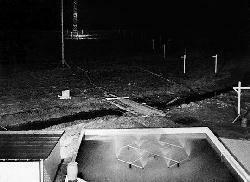 The new antenna reduced distant listening while it improved the nighttime signal in the far suburbs of the Bay Area. Most peak limiters sampled audio level at the output stage, thus sudden peaks could escape before the level could be turned down. The GE limiter sampled audio level at the input. Then it put the audio through a delay line before it reached a variable gain stage. Since the variable gain was adjusted before a peak got there, absolutely no peaks escaped to cause overmodulation. Stations using this limiter sounded louder and cleaner than stations using any other brand. 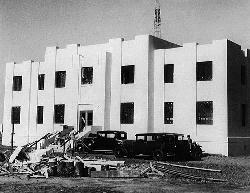 KNBC had a Morse code line between the Belmont transmitter and master control in San Francisco Radio City. Almost all the transmitter engineers could send and receive code. This Morse line was very cheap to lease from the telephone company. The reason, I was told, was that AT&T had no desire to have to go into the telegraph business even though the second “T” in its name stood for “Telegraph”. Thus, AT&T subsidized Western Union to help keep it in business by leasing Morse lines at very low rates. In those days few radio stations had auxiliary or backup transmitters. Operators were expected to get the station back on the air quickly in case of equipment failure. KNBC did not get a backup transmitter until some time in the 1960’s when Civil Defense authorities bought a ten kilowatt AM transmitter for the purpose. In the 1950s KNBC broadcast a one kHz tone at about 30% modulation level as part of the Conelrad Civil Defense alerting system between about 2 AM and 5 AM, while no regular programs were broadcast. Every half hour, a transmitter operator would play a transcribed station identification. Special dispensation had been obtained from AFTRA, the announcer’s union, to allow the station to broadcast without a staff announcer on duty. Copyright © 1998 Fred Krock. All rights reserved. Reprinted with permission.